One of the best things about living in Seattle is how many beautiful places are within easy reach, enabling outdoor lovers to get out and play on a day-to-day basis. But summer wouldn’t be complete without at least one or two road trips thrown in, and some of the Pacific Northwest’s most amazing areas are far enough away from Seattle that they require a whole weekend (at least) to explore them. Here, some recommended ideas for summer road trips from Seattle, what kinds of adventures you can enjoy while you're there, and the best spots to stop for grub along the way. Time to hit the road. The alpine scenery around the Methow Valley is stunning. The Methow Valley is eastern Washington’s bona fide outdoor mecca, a summer hotspot for hiking, mountain biking, trail running, and rock climbing alike. Try to leave early enough on Friday to take advantage of some daylight on the drive out there: The views along Highway 20, otherwise known as the North Cascades National Scenic Highway, are amazing. Choose from many campgrounds along Highway 20. The town of Mazama, which is home to a range of inns and cabins, is also a great place to base your adventures from. Saturday morning, fuel up for the day with some delicious pastries from the charming Mazama Store. 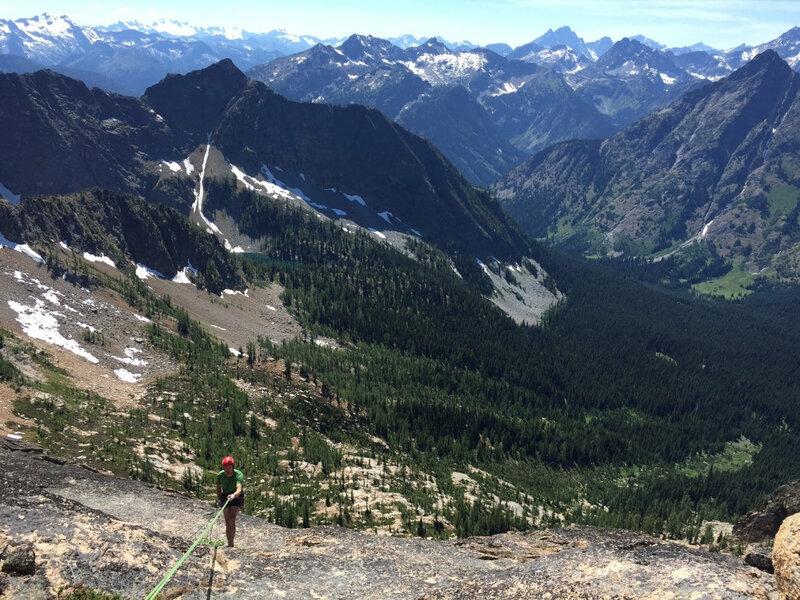 After that, you’ll be in prime position to choose your own adventure: Hike to Harts Pass, run up Cutthroat Peak, mountain bike Methow Trails, climb in Washington Pass, or take a raft down the Methow River. On Sunday, rock climbers may want to head back early enough to stop at Newhalem, a granite sport crag with lots of fun routes. And no summer road trip is complete without ice cream: On the way back, be sure to stop at Cascadian Farms for fresh fruit and a homemade scoop. Outlandish rocky spires rise out of the water at Shi Shi Beach. 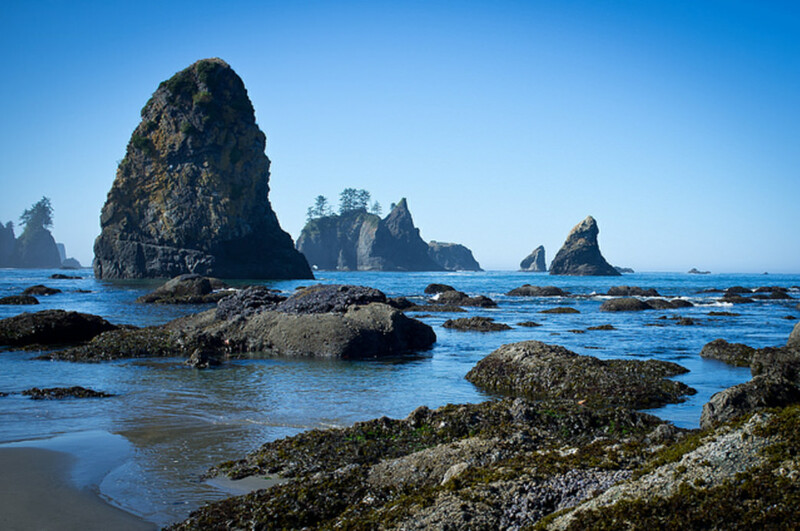 As a wonderland made up of mountains, rainforests, and water, there are tons of reasons to visit Olympic National Park. One of the coolest weekend excursions to the park, however, is to explore its surreal, beautiful coasts. The trip begins with a quintessential Seattle commute: a boat ride across the Sound. Take either the Bainbridge Island ferry from downtown or drive north to catch the Edmonds-Kingston ferry to get across to the Olympic Peninsula. For a fun alternative to the grocery store, spend Friday night in Sequim (there is camping available at Sequim Bay State Park) in order to go clamming the next morning. You will leave with a bounty of butter, littleneck, and horse clams that you can bring to cook up on the beach that night (just remember to get a shellfishing permit beforehand). Bivalves in hand, continue your drive across the peninsula to the Shi Shi Beach trailhead. If you’re feeling ambitious, you can also take a detour to the jaw-dropping Crescent Lake along the way. Once at the trailhead, it’s just two miles downhill to the beach: You can camp anywhere along the two-mile stretch of coast, with ethereal views of rocky towers jutting out from the water. Squamish, just over the border in British Columbia, is another fantastic choice for a multisport weekend trip. Leave as early as you can on Friday in order to minimize traffic, which can pile up at the border, and snag a site at the wonderful campground located at the base of the Stawamus Chief. This campground provides a great launch pad for the area’s plentiful rock climbing, mountain biking, and hiking. Saturday morning, drive through the town of Squamish to Zephyr Café, which serves lip-smacking yet healthy food popular among the town's visiting outdoor adventurers. Then spend the day hiking up to the top of the Chief, climbing its epic granite walls or boulders, or mountain biking along Squamish’s more than 60 miles of single-track mountain biking trails. A surfer heads out to catch some waves at Westhaven State Park. 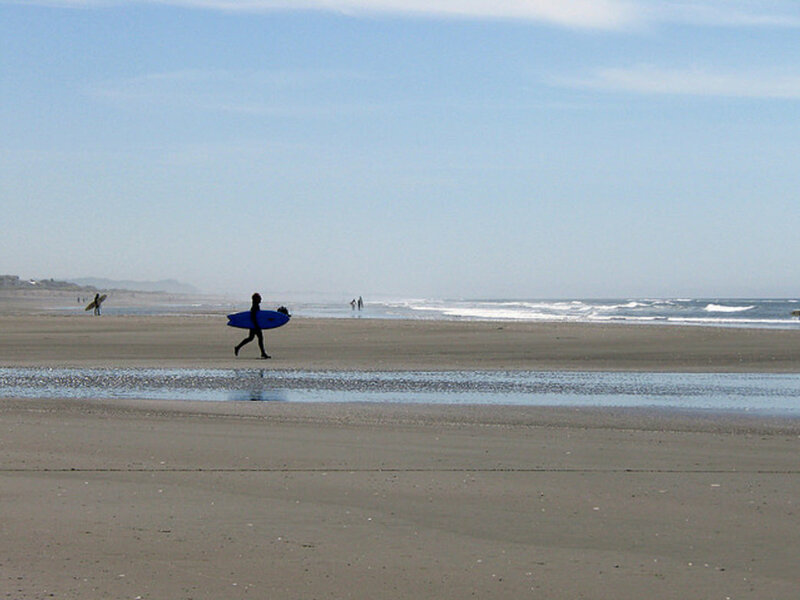 Washington State may not be known for its surfing, but spend a weekend in Westport and you may wonder whether you’ve been transported to a California beach town. While the drive is a bit shorter than other road trips, this excursion will nevertheless make you feel as though you’re a million miles away. Start the trip taking in the taste of the ocean by stopping for oysters in Aberdeen on the way there. Buy them by the bag from Brady’s Oysters, a low-key joint where you can take them with you and shuck them yourself. The best place to camp is on the beach at Twin Harbors, just south of Westhaven State Park (where the surf breaks are). In the morning, get psyched to get in the waves over a cup of joe from Tinderbox Coffee Roasters, conveniently located right near the Surf Shop, where you can rent a board and wetsuit. The staff there is very friendly, knowledgeable, and helpful. Before heading down, check conditions online.